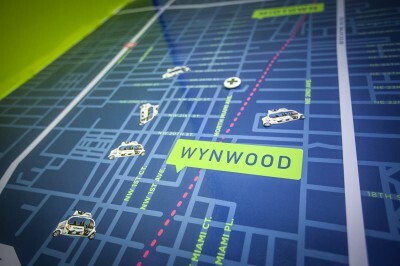 A new form of advertising and a new method of transportation – FREE transportation – has been wowing the Miami and Miami Beach areas since 2012. 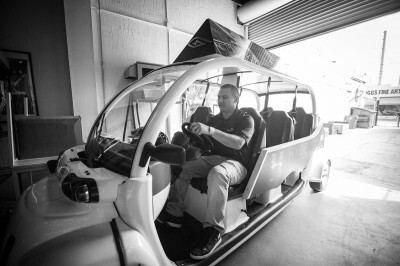 A fleet of fully customized open-air electric cars, called Freebees, cruise the crowded streets offering free, short-distance rides to anyone in need. “Each Freebee is dedicated to marketing a product or business, each one showcasing its own unique brand story or campaign message through Freebee’s multiple media touch points. Each Freebee acts as an eye-catching mobile billboard, captivating the attention of locals and tourists alike,” said 28-year old co-founder, Jason Spiegel. Spiegel has been operating the company, BeeFree, LLC with his former college roommate, Kris Kimball, and creative consultant Amir Youssef for the past three years. Business for BeeFree has been exceptionally good. Everybody loves the offer of free rides, and businesses benefit from getting their brand “out there” in this unique way. 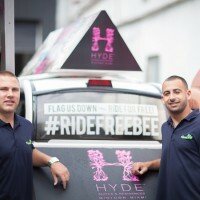 The company started with half-a-dozen Freebees and by 2014, the fleet has steadily increased to a fleet of 20 vehicles. Spiegel says their plan is to add another 10 to 20 vehicles by the end of 2015. Freebees serve the Miami Beach area from 1st to 45th street, and throughout Downtown Miami, including Brickell and Wynwood. However, Spiegel and Kimball wanted to grow their business. A business associate introduced the Freebee Team to Marjorie Weber, a business finance consultant with the Florida SBDC at FIU, part of the College of Business. The FSBDC offers guidance from experienced experts who provide quality business consulting to help small-and-medium-sized businesses grow and succeed. As a result, BeeFree received a working capital loan funded by C1 Bank. “The increased capital has allowed us to hire new drivers, and we’re creating an App Sales Division to help our clients advertise specials and discounts to entice riders to visit,” said Kimball. In total, the additional funding will be responsible for raising the number of office employees from 20 to 25, and the number of drivers from 40 to 45.The Freebee Team is enthusiastic about the forecast for their business, and enthusiastic about the role the FSBDC at FIU has in Freebee’s future. "To get the expert help we needed at no cost is an incredible advantage. Obtaining capital was something we needed to retain and grow jobs. We went through the process with someone on our side. We’re very grateful."